The Jerusalem Windmill Will Soon Turn and Mill Again. 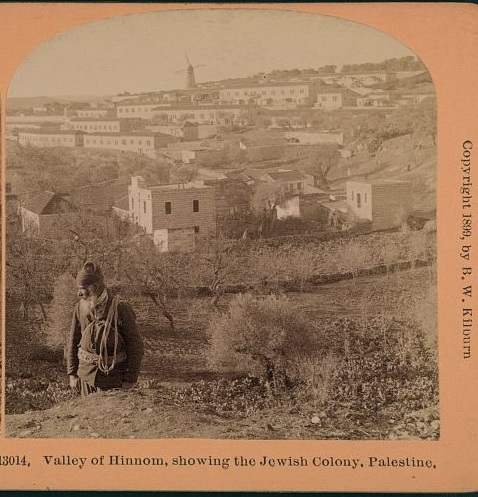 "View of building and windmill built by Sir Moses Montefiore." Phillips in May 1866 -- a period when the mill was operational. 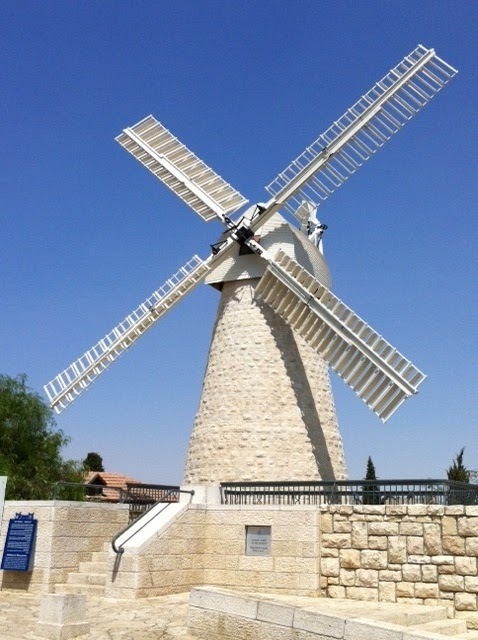 The Montefiore windmill is one of the most famous landmarks in Jerusalem. Built in 1857 to provide employment and low-priced flour for Jerusalem's Jews, the mill was operational for only 18 years. In a recent Ha'aretz article, Nir Hasson reported that "Arab millers tried to sabotage the venture by paying someone to cast a curse on it. S.Y. 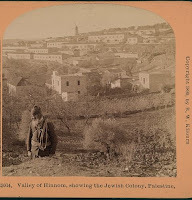 Agnon wrote of the affair in his book Only Yesterday: 'And the Arabs saw and were jealous. They hired an old man to curse the windmill. He turned his eyes to the windmill and said, I guarantee you that when the rains come and the winds come, they will make it into an everlasting ruin, and the rains came and the winds came and didn't do anything to it.'" Over the next century, the windmill stood idle. On the eve of the 1948 war, however, the British High Commissioner Alan Cunningham was leaving the nearby St. Andrews Church when he noticed that the Jewish Haganah had put a gun emplacement on the top of the windmill. Cunningham ordered the destruction of the position. According to Jerusalem legend, the British sapper sent to blow up the mill recognized the name "Montefiore" on the building as the name of a school in England. He only destroyed the sniper's nest. In the last 40 years repairs have been made to maintain the building's structure, but no effort was made to restore the actual mill -- until now. The Jerusalem Foundation, the Jerusalem Municipality, Dutch Friends of Israel, Israel's Ministry of Tourism and the Prime Minister's Office are sponsoring the restoration of the mill. Once opened at the end of August, the mill will produce flour that will be made into bread and sold at the mill. The mill will have backup electric motors when wind power is not sufficient. But it never ground flour. Taken from ''the Poems of Jerusalem'', Schocken Publishing House, Ltd.
And we should recall Avraham Kirschenbaum who, on February 10, 1948, stymied and held off a large-scale Arab attack on Yemin Moshe from the Jaffa Gate area after they had takenn over what is today the Confederation House. Avraham, aged 22, was killed when, after first being shot by a British sniper at the King David Hotel, was carried up to the windmill area and while waiting for the ambulance, was shot by a dum-dum bullet fired by yet another sniper located in the David (Daud) Brothers Building at corner of now Jabotinsky & Keren HeYesod Streets which caused his death. A picture is here. Wow nice history picture and story post in your blog is great.I like it. It should mentioned that the article above by Nir Hasson is based on an interview with Hebrew University historian, Dr. Shaul Sapir.